Though the film “Can You Ever Forgive Me?” has quietly made its way into theaters nationwide, it has rightly earned recognition for its outstanding acting and writing. 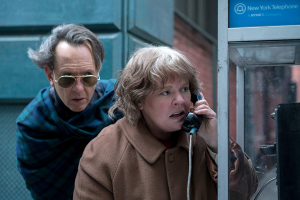 Set in New York during the 1990s, this movie is a biopic about Lee Israel (Melissa McCarthy), a struggling author who turns from her writing to forging signed celebrity letters and selling them with her eccentric friend, Jack Hock (Richard E. Grant). These two actors give performances for the ages and are well-deserving of their Oscar nominations. Israel explains her character best in the film when she says she “likes cats better than people,” and nobody but Melissa McCarthy could have nailed the role of this often cold-hearted author. The dramatic role was well-played by McCarthy, proving that she is more versatile of an actress than her comedies may show. While not the lead, Hock makes his presence known every time he is on the screen and captures the audience’s attention as he buoyantly flows through his scenes. Grant and McCarthy’s on-screen chemistry is immediately noticeable. Their first meeting is particularly masterful since it’s the first time viewers see how well these two characters connect. The film’s close-ups are stunning, and McCarthy knows how to dominate every single one. The close-ups linger on her more than any other character, and she helps the audience understand what emotions Israel is feeling through her expressions. Her motivations develop in a single shot, which is a rare display of talent as the editing typically tries to hide an actor’s inability to do this. The editing of “Can You Ever Forgive Me?” effectively brings out the best performances from Grant and McCarthy. During conversations, the camera slowly brings us closer to the characters, emphasizing the deepest parts of the conversations. Though the close-ups are nearly perfect throughout the whole movie, the camera operator’s work overall was not impressive — sometimes the camera movements were too shaky. Even so, cinematographer Brandon Trost made up for these mishaps by directing the lighting and camera placement for each scene very well. We are put in numerous interior locations that are warmly lit, providing a contrast to the snowy exteriors. Ultimately, Trost makes decisions that make the picture look beautiful despite a handful of bobbly camera movements. Director Marielle Heller impresses in just her second feature film. She shows great potential as a director by giving us two lovely performances by the lead actors. However, some of the supporting cast members leave forgettable performances compared the leads. This is where Heller can improve the most. Since Grant and McCarthy deliver spotless performances, the slips of the supporting cast are forgivable. I’m excited to keep up with Heller in her directing career to see if she continues to produce award-worthy films in the future. The story of Israel is a beautiful one, and “Can You Ever Forgive Me?” is a well-written and well-performed telling of that story. Watching this movie gives me hope that McCarthy will pursue further serious roles, but for now we’ve got her performance as Israel to keep us optimistic.